Spicy pickles or also know as achars are very important condiments in an Indian meal. Pickles enhances the tastes of the meal and increases the satisfaction after every meal. Pickles are easy to prepare with right ingredients and can be preserved for months. Spicy green chili pickles. Mango pickles infused with fenugreek and cardamom. Bright yellow cauliflower pickles with turmeric. Indian achars are almost too good to be called condiments.In fact, achars are a singularly versatile kind of pickle. They can be made from fruits or vegetables, and be made sweet, spicy, or sour depending on the spices and flavorings used. A small amount of gingery pickle might balance the flavors in a spicy curry while a sour one can serve as an appetizer with papadum. 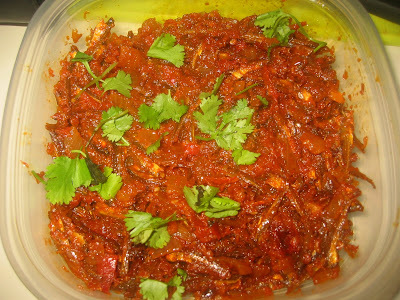 An achar can also be mixed with fresh vegetables to make a quick salad. No matter how they're used, these pickles are intended to enhance a dish and add new dimensions of flavor.Unlike the vinegar based pickles - Indian pickles are usually made with oil. The high concentrations of salt and preserving spices like turmeric keep the pickles safe to eat for long periods of time, even without refrigeration. Traditionally, families in India make achar during the summer to serve with meals in the coming months. Indian markets carry a wide range of commercially produced achar, but it's also very easy to make them at home:Not many people realize that doing a pickle at home can be easy. Specially if you want to do something from fresh ingredients, don't want to do huge quantities and can consume quick. 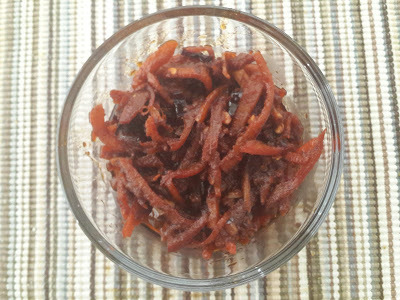 Hey guys stop wasting time -rush to your kitchen and gear up the store to prepare this mouth-watering Orange Peel Pickle. Heat 1/2 cup of the coconut oi land set aside.In a large bowl, add the sliced orange peels,shallots,garlic cloves and chilies with salt lemon and orange juice,vinegar and chilles powder, mix them well till they coated with the spices and then add the warmed coconut oil-mix well.Let it stand for 1 day. Soak the dried chillies in the tamarind juice for 2 hours and blend into a smooth mixture. Coat a frying pan with the remaining coconut oil, add the mustard seeds. Once it starts to crack add the curry leaves and marinated mixture and saute well in the oil for about 15 minutes or until the are tender. Then add the chillie, cumin and pickle powder followed by the blended mixture and hing powder .Once all the tamarind juice are dissolved, remove from flame. Let the pickle cool before storing in tight container.